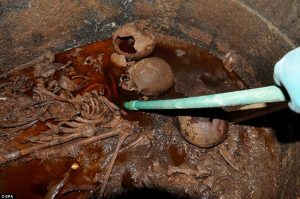 Egyptologists Open 10 Foot Long Sarcophagus in Alexandria – Zero Equals Two! “A mysterious ten foot (three-metre) long black sarcophagus has been opened in Alexandria, found on the northern coast of Egypt and founded by the legendary leader of the same name. “The 6.5ft (two metre) high coffin was first discovered earlier this month and unearthed in recent days. “The 30-ton (27,000 kg) tomb was found buried 16ft (five metres) beneath the ground of the city. “Egyptologists pried open the black granite sarcophagus earlier today to reveal three decomposed bodies. Read the whole article: http://www.dailymail.co.uk/sciencetech/article-5970923/Archaeologists-ancient-pottery-workshop-Egypt.html.